This is the first in our new series of “Me and my ‘van” articles. This one features Caravan Guard’s own Director, Ryan Wilby, along with his wife Laura and little girls Scarlett (3) and Freya (1). If you’d like to feature in the next instalment then see the details at the bottom. My parents tell me we had a caravan when I was a baby but I can’t remember it. I have always loved camping, from setting up the family tent as a boy and being allowed to sleep out overnight in the garden, to venturing further afield when I got my driving licence. I loved the freedom of a road trip and a night or two under canvas with my friends. Scarborough and Whitby were favourites and a weeklong trip to Wales is especially memorable because this is the first time I went surfing on Llangennith beach. My parents bought a caravan when I was about 20 and were kind/mad enough to let me borrow it for music festivals. Probably only because my now wife Laura was in tow and deemed much more trustworthy than me! Around the same time a good friend of mine had converted his own motorhome on a huge Iveco chassis for a snowboarding season trip, and slowly each of my camping buddies seemed to get their hands on some kind of leisure vehicle, from a converted transit to a cheap leaky old tourer. I can recall the entire group in hysterics when one friend was packing up just such a ‘van after a weekend in Wales; we heard a loud crash and turned round to see his tiny old caravan at 45 degrees after he went back in with the steadies up! Who goes caravanning with you? I still go for caravanning holidays with the same friends but now most of us have kids and the caravans are mainly water tight! 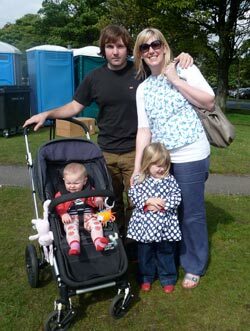 “Team Wilbs” as we like to call ourselves consists of myself, my wife Laura and our gorgeous two girls Scarlett and Freya. Laura and I have been together since we were in high school and have now been married for 4 years. She is more of a hotel girl than a camper though and to this day I have never seen her spend a night in a tent – she was happy to try caravanning though as long as I do all the emptying of the Thetford toilet cassette! She actually really enjoys touring now and we have many miles and campsites under our collective belts. Tell us a little bit about your van: What make is it? What are your favourite features etc? We are the proud owners of a 1998 Knaus Sport & Fun. I am a bit of an extreme sports fan so it is the perfect ‘van for me. You enter the Sport and Fun from the rear and the door is oversized to accommodate carrying sports equipment. There is even a ramp and straps to carry a motocross bike inside though unfortunately our model doesn’t have this accessory! There isn’t much in the way of soft furnishing so all the surfaces are easy to wipe down. A ladder at the rear allows access to the roof rack making it possible to carry surf boards, kayaks and there is a Fiamma bike rack built onto the A- Frame. The layout is perfect for two and I think it was one of the early adopters of the permanent fixed double bed layout. However, there is no oven and only a tiny water heater making warm showers limited to a couple of mins. Now that Team Wilbs is four strong we are looking to potentially upgrade to a bigger model. There have been some exciting developments in caravan design in recent years but nothing quite excites me quite as much as the way the Knaus Sport and Fun did when I first saw it in 1998. The Deffleffs Aero Style caught my eye because it is also a little bit different but I think deep down I couldn’t say goodbye to the Knaus, so we may just have to carry on with the cosy living arrangements. 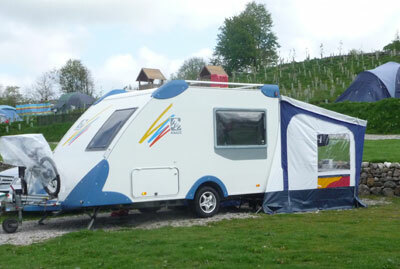 Where did you go on your last caravanning holiday and what was it like? We toured the French coast and Zebrugge, Belgium all the way down to The Great Dune of Pyla, near Bordeaux, France a couple of years ago and La Rochelle sticks in my mind as a highlight of the Trip. 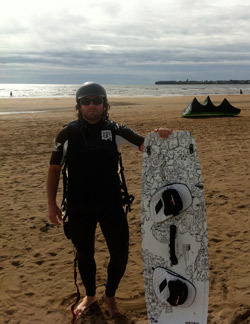 After learning to Kite Surf in New Zealand a few years previously that was the first trip where I had my own Kite Surfing gear with me and I was amazed at how popular Kite Surfing is in France. So that is definitely a tour I would like to repeat. 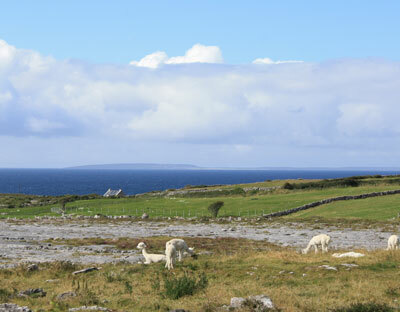 Our most recent trip was a few months ago to tour the west coast of Ireland, and I can safely say we encountered some of the most amazing scenery I’ve seen anywhere. 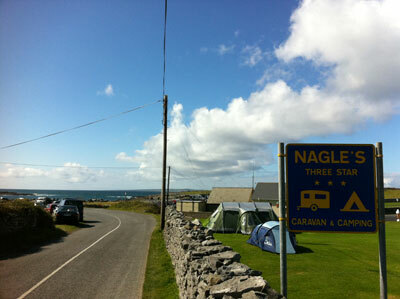 Nagle’s campsite in Doolin near the Cliffs of Moher has to go down as one of the most fantastic locations for a campsite we have been a guest of. 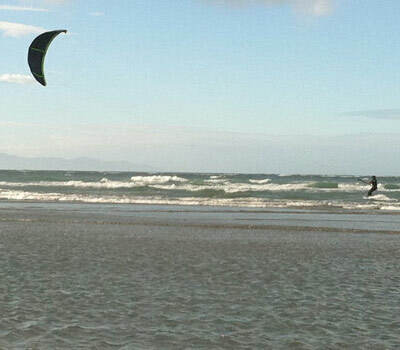 I also managed to squeeze in 2 kite sessions at Galway and Lehinch, so I came home with a big smile on my face. Until Scarlett was sick down my leg on the ferry home that is! All in all another great family caravanning trip in the memory banks. What are your three favourite things about caravanning? What is the one bit of kit you couldn’t live without when away with your van? My kite surfing kit and mountain bike. Oh and the BBQ! If you’d like you and your ‘van to feature in our next E-newsletter then send 3-5 good quality photos of you and your caravan or favourite destination, along with some brief answers to the below questions, to info@caravanguard.co.uk. Whoever we choose to feature in the Freedom Newsletter will recieve £20 worth of a Marks & Spencers vouchers as a little thank you from us, as well as the chance to show off your new found fame to family and friends! I’m thinking of buying one for my son and I. Is it possible for me to connect/contact Nora to discuss the van please? Great article – enjoyed reading it – great pics too. I loved it when we had the Sport and Fun – great little van!